April 19, 2018 - Miner is pictured in the Pittsburgh Business Times' online edition, speaking with a PNC Bank executive, at the annual “Outstanding CEOs and Top Leaders” awards dinner, sponsored by Fox Rothschild LLP. April 13, 2018 - Miner presents chapter 7 of Forged in Steel -- about the Pittsburgh Steelers' time-tested way of mental toughness -- at a Beaver County Chamber of Commerce breakfast club meeting held at the Trinity School for Ministry in Ambridge, PA.
March 2018 - Signed copies of Miner's books Well At This Time and Forged in Steel -- co-authored by Tunch Ilkin and Damian Williams -- are donated to the Beaver County (PA) Chamber of Commerce for its 2018 Gala silent auction. Feb. 21 , 2018 - For the third straight year, Miner donates a copy of Forged in Steel, signed by co-authors Tunch Ilkin and Damian Williams, to the Pittsburgh Post-Gazette Dapper Dan Dinner and Sports Auction, with the book sold to the highest bidder for 34 percent above the retail price. Feb. 4, 2018 - Forged in Steel and its powerful chapter 7 on "mental toughness" are the focus of Miner's presentation at West Virginia University's College of Business and Economics, the 11th year in which he has been a guest lecturer at WVU. Many thanks to Michael Walsh, Ph.D., for the invitation. Nov. 21, 2017 - The membership of the Beaver Area Heritage Foundation elects Miner to its board of directors, an organization for which he served as president in 2005-2006. Oct. 12, 2017 - In a ceremony held in the state museum in Harrisburg, Pennsylvania First Lady Frances Wolf (wife of Gov. 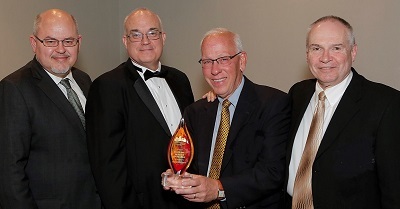 Tom) and Preservation Pennsylvania Board Chair Nathaniel Guest present Beaver Station Cultural & Event Center with a 2017 “Pennsylvania Historic Preservation Award." Accepting the handsome framed certificate on behalf of the Beaver Area Heritage Foundation are David O’Leary, Charles Copeland and Miner. Above: Miner monitors a media relations panel with, L-R: Kristen Doerschner, Mario Leone and Bethany Williams. Below: reconnecting with former Pittsburgh Mayor Tom Murphy, now of the Urban Land Institute, who despite much opposition was a visionary who helped transform a broke city in the mid-1990s, and among other highlights helped save the Pirates and Penguins for Pittsburgh and select the site for America's best baseball-only park. As head of media relations for the Mayor's law firm on the Pirates and Penguins matter in the 1990s, Miner and the firm's CEO created a framework for advocating the Mayor's agenda in the public converation..
Aug. 10, 2017 - At the Beaver County Local Government Conference, held at Community College of Beaver County, PA, Miner moderates a panel conversation on how municipalities can contribute to the overall county public conversation by working more effectively with news reporters from the Beaver County Times. Panelists include Kristen Doerschner, assistant managing editor of the Times; Mario Leone, borough manager of Monaca Borough; and Bethany Williams, Director of Community Development for the City of Beaver Falls. The event is sponsored by the Beaver County Regional Council of Governments. June 29, 2017 - Miner is interviewed in two videos shot at Beaver Station Cultural & Event Center by Rob Pratte of KDKA/Pittsburgh, for his ongoing “Your Pratte Pack” series on YouTube, about all the good things happening in Beaver County, near Pittsburgh. Clip #1 -- "Good Business" -- also features Rick Okraszewski of the Keystone Mountain Lakes Regional Council of Carpenters, and clip #2 -- "Beaver Magic" -- is staged at the Belvedere on the Station's great lawn. May 26, 2017 - The Beaver Area Heritage Museum receives a 5-star rating and comment on Facebook from Andrew Masich, CEO of the Heinz History Center in Pittsburgh, an affiliate of the Smithsonian, reading: "This is one of the best small museums in Pennsylvania -- well worth a visit." Final YouTube Channel video interview between Miner and Dr. Jim Dittmar about Forged in Steel and the Pittsburgh Steelers' time-tested way of mental toughness, as presented over 7 months by Leaders Serving Beaver County. Above: German Foreign Minister Sigmar Gabriel accepts a Pittsburgh Penguins jersey from Allegheny County Executive Rich Fitgzerald (left) and Pittsburgh Mayor Bill Peduto (right). Below, the round table held at the Energy Innovation Center in Pittsburgh. May 18, 2017 - Miner Communications is deeply honored to have assisted the Paul Overby, Honorary German Consul in Pittsburgh, during today's visit by German Foreign Minister Sigmar Gabriel and German Ambassador Peter Wittig, traveling with 60 members of German Parliament, CEOs, cultural luminaries, diplomats and journalists. During a round table discussion about Pittsburgh’s transformative success, held at the Energy Innovation Center, Mayor Bill Peduto presents the Foreign Minister with an official Pittsburgh Penguins #34 jersey of German-born winger Tom Kuhnhackl, who helped the Penguins win a Stanley Cup last year and whose father, Erich Kuhnhackl, is a hockey legend who has been named Germany's top hockey player of the 20th century. May 2017 - Hardback editions of Miner's book Well At This Time: The Civil War Diaries of Ephraim Miner, chronicling the journey of an injured Union soldier who languished for two-and-a-half years in the Army's ill-equipped health rehabilitation system, are now stocked for sale on the shelves of the National Museum of Civil War Medicine in Frederick, MD. The museum and its sister properties, the Clara Barton Missing Soldiers Office in Washington, DC and the Pry House Field Hospital Museum on the Antietam National Battlefield, serve as the premier center for the preservation and research of the legacy of Civil War Medical innovation and humanitarianism. 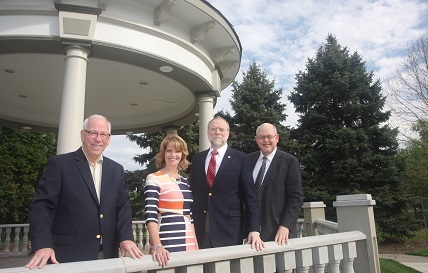 Heinz History Center CEO Andrew Masich (2nd from right) tours Beaver Station's new Belvedere with, L-R: David O'Leary, Leanne Rogowski and Miner. April 27, 2017 - Miner and a team from the award-winning Beaver Station Cultural & Event Center and Beaver Area Heritage Museum host the Heinz History Center's Andrew Masich and Robert Stakeley for a tour, dinner and reception to formally launch the "We Can Do It" traveling World War II exhibit at the museum. In the final of 7 monthly workshops, Leaders Serving Beaver County's Dr. John Stanko presents about Forged in Steel and the Pittsburgh Steelers' time-tested practice of mental toughness. April 20, 2017 - In the the final installment of Leaders Serving Beaver County's 7-month workshop series featuring Forged in Steel, Dr. John Stanko leads a conversation about chapter 7 -- "mental toughness" the uniquely Steelers' way. Leaders Serving Beaver County interview on YouTube between Miner and Dr. Jim Dittmar about Forged in Steel and the Pittsburgh Steelers' time-tested way of continuous improvement through deliberate practice. March 24, 2017 - In remarks at a press conference in Pittsburgh, Heinz History Center CEO Andrew Masich announces that the Smithsonian-caliber "We Can Do It!" traveling World War II exhibit will make its first stop at the Beaver Area Heritage Museum, and mentions Miner and his museum colleague Diana Neel twice, inviting them to pose for photos. See the resulting television coverage on KDKA-TV and WTAE-TV. Leaders Serving Beaver County's Dr. Jim Dittmar presenting about Forged in Steel and the Pittsburgh Steelers' time-tested way of continuous improvement through deliberate practice. 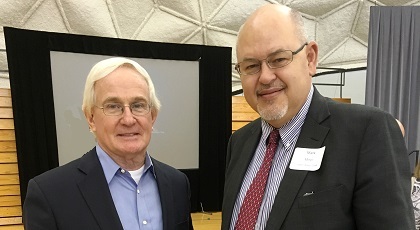 March 16, 2017 - The Steelers' way of deliberate practice -- chapter 6 of Forged in Steel -- is analyzed by Dr. Jim Dittmar of Three Rivers Leadership Institute at the Leaders Serving Beaver County workshop hosted by Penn State Beaver. March 8, 2017 - Mark Miner Communications LLC rolls out its special 15th anniversary logo, having been launched on Jan. 15, 2002 following Miner's decade-plus as head of media and public relations for the law firm of Buchanan Ingersoll. 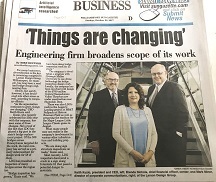 Today the firm continues to fulfill its original mission of providing high quality marketing communications services to professional service firms. 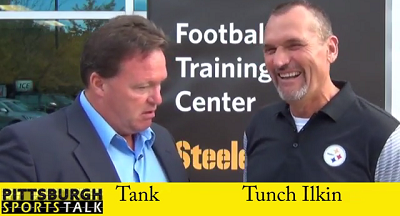 Leaders Serving Beaver County interview on YouTube between Miner and Dr. John Stanko about Forged in Steel and the Pittsburgh Steelers' time-tested way of passionate execution. 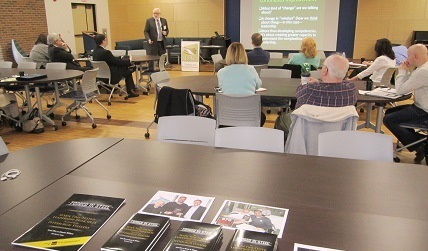 Feb. 23, 2017 - Publisher Mark Miner speaks about Forged in Steel at a Beaver County Chamber of Commerce member reception in Beaver, PA.
Dr. John Stanko leading a Leaders Serving Beaver County workshop based on Forged in Steel and analyzing the Pittsburgh Steelers' way of "passionate execution." 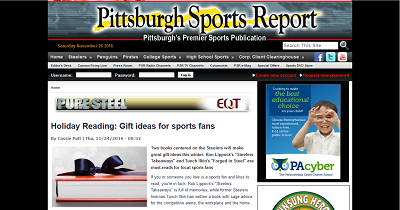 Feb. 16, 2017 - The Steelers' way of passionate execution -- chapter 5 of Forged in Steel -- is analyzed by Dr. John Stanko of PurposeQuest at the Leaders Serving Beaver County workshop hosted by Penn State Beaver. Forged in Steel sells for a premium above retail price in the silent auction of the 2017 Dapper Dan Dinner in Pittsburgh. Feb. 15, 2017 - For the 2nd straight year, a signed copy of Forged in Steel sells for a premium above its retail price at the 81st annual Dapper Dan Dinner & Sports Auction, recognizing the best in Pittsburgh sports and benefiting Pittsburgh Post-Gazette/Dapper Dan Charities. Feb. 12, 2017 - Broadcaster Rudy Reyes of "The Rude Dog Show" on WBLZ Sports in Fullerton, CA tweets: "#Steelers fans need to pick up #ForgedInSteel #insightful #faith #personal #growth #leadership." 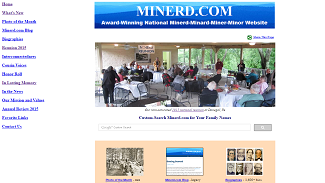 Feb. 9, 2017 - Miner releases the 2016 Annual Review of his award-winning, nationally recognized genealogy and regional history website, Minerd.com. During the year, 17 new biographies were added – many so lengthy that they will be subdivided into new ones in 2017. Many hundreds more bios were expanded with new findings – bringing the total bio count on the site to 1,610. Some 1, 034 images were added as illustrations, upping the overall site-wide count to 14,541. Leaders Serving Beaver County interview on YouTube between Miner and Dr. Diane Galbraith about Forged in Steel and the Pittsburgh Steelers' way of strategic team making. 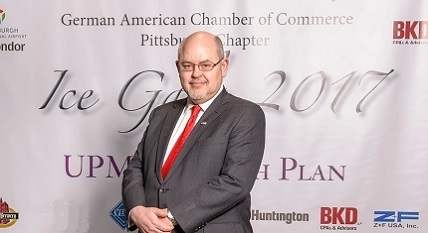 Jan. 28, 2017 - Miner is honored to represent banking and public accounting firm clients on the red carpet at the German American Chamber of Commerce 2017 Ice Gala held at the Energy Innovation Center in Pittsburgh. Slippery Rock University's Dr. Diane Galbraith presenting on "strategic team making" at the Leaders Serving Beaver County workshop based on Forged in Steel. Jan. 17, 2017 - The Steelers' way of strategic team making -- chapter 4 of Forged in Steel -- is analyzed by Dr. Diane Galbraith of Slippery Rock University at the Leaders Serving Beaver County workshop hosted by Penn State Beaver. 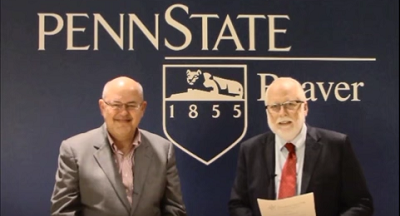 Leaders Serving Beaver County interview on YouTube between Miner and Dr. Jim Dittmar (right) about the values of "servant leadership" the Pittsburgh Steelers' way as described in Forged in Steel. about "contagious humility" as practiced by the Pittsburgh Steelers. Nov. 14, 2016 - Miner presents on "Mental Toughness," chapter 7 of Forged in Steel, at a class of Community College of Beaver County, PA, at the request of Dr. Chester Delon Thompson. October 2016 – Led by Rev. Dr. Kevin Gourley, a men’s study group at Memorial Park Presbyterian Church in Allison Park, PA, a Pittsburgh suburb, begins an extended chapter-by-chapter study of Forged in Steel that is expected to continue well into 2017. Oct. 22, 2016 - Forged in Steel and Well At This Time are among the featured publishers, authors and books at "A Novel Affair," a fundraiser benefitting the Carnegie Library of Beaver Falls, PA, with publisher Miner exhibiting his titles. Oct. 21, 2016 - Mental health professional Jessica Janicki -- a board director of Mental Health Association in Beaver County -- wins a signed copy of Forged in Steel in the Grand Silent Auction at the Halloween Spook-tacular dinner benefitting the Association, held at the Club at Shadow Lakes in Aliquippa, PA.
Sept. 22, 2016 - Forged in Steel is exhibited at the Beaver County (PA) Regional Council of Governments conference in Beaver Falls, in partnership with Leaders Serving Beaver County. Sept. 15, 2016 - Leaders Serving Beaver County hosts the first of seven monthly "Leaders Workshop" classes at Penn State-Beaver, taught by Dr. John Stanko and drawn from chapter 1 of Forged in Steel, the popular Pittsburgh Steelers leadership values book co-authored by Tunch Ilkin and Damian Williams. Sept. 9, 2016 - At a 90th birthday party for his friend, mentor and onetime boss Robert Allen Smith, former advertising and public relations executive with U.S. Steel Chemicals and Michael Baker Corporation, Miner makes a "This Is Your Life" presentation for an invitation-only audience of 100 friends at Beaver Station Cultural and Events Center. Aug. 15, 2016 - Miner is appointed to the executive committee of Mental Health Association in Beaver County by association president Nancy J. Homan. March 29, 2016 - For the 10th time, Miner presents a guest lecture at West Virginia University's College of Business & Economics, on the topic of "Mental Toughness: or What They Didn't Teach You in College." The class is led by Michael F. Walsh, PhD, Department Chair & Associate Professor of Marketing. The talk features hard-hitting content from his more than 30 years of experience crafting the public image of professional service firms as they become key decision-makers at the table of business and civic leadership. The topic also is drawn from chapter 7 of the widely acclaimed book which Miner published, Forged in Steel: The Seven Time-Tested Leadership Principles Practiced by the Pittsburgh Steelers, co-authored by Tunch Ilkin and Damian Williams. March 24, 2016 - Following Miner's lecture on "mental toughness" from chapter 7 of Forged in Steel, at a leadership team class at Community College of Beaver County (PA), a young undergraduate remarks, "I needed to hear this. Tonight. Right now." It's a hint of the power of the Steelers' leadership values to impact and change lives. March 22, 2016 - Miner participates in the Uzuri Think Tank at Robert Morris University in Pittsburgh, part of the Coalition for Black Male Educational and Workforce Issues, led by Dr. Anthony Robins and Chester D. Thompson, D.Sc., among others. March 17, 2016 - Hosted by Dr. Chester Delon Thompson, Forged in Steel publisher Mark Miner gives a guest lecture at Robert Morris University on chapter 7 of the book, "Mental Toughness." March 16, 2016 - Wendy Lydon, vice president with ThistleSea Business Development, wins a signed copy of Forged in Steel at the Great Gathering at Southpointe -- hosted by The Pittsburgh Social Exchange -- with proceeds benefiting the Washington (PA) City Mission. Feb. 22, 2016 - A limited number of copies of Forged in Steel are available to be signed by co-authors Tunch Ilkin and Damian Williams on the Legends of Pittsburgh Cruise, sailing from Miami to Key West and Cozumel. Feb. 17, 2016 - A signed copy of Forged in Steel is auctioned for more than five times its retail price at the 80th Annual Dapper Dan Dinner and Sports Auction benefitting Dapper Dan Charities and the Boys and Girls Clubs of America. 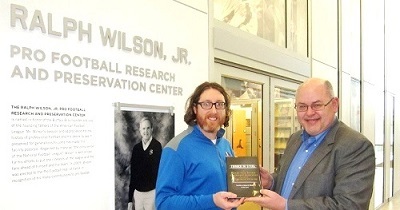 Jan. 4, 2016 - The Pro Football Hall of Fame adds a signed, first edition copy of Forged in Steel to its permanent research collection in Canton, Ohio. Here's why.